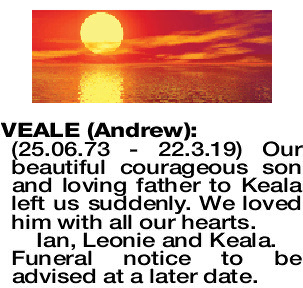 VEALE ANDREW (25.06.73 - 22.3.19) Our beautiful courageous son and loving father to Keala left us suddenly. We loved him with all our hearts. Ian, Leonie and Keala. 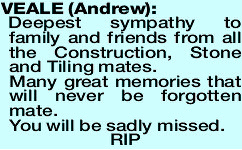 Funeral notice to be advised at a later date. The Funeral Cortege for the late Andrew Veale will arrive at KARRAKATTA Cemetery, WEDNESDAY (3.4.2019) for a Chapel Service commencing at 2:30pm. At conclusion of the Service, the Cortege will proceed to the Graveside for a Burial Service. VEALE ANDREW Cherished nephew of Roger and Jeanette and cousin of Jessica and Alam and Holly. 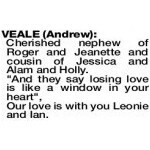 Our love is with you Leonie and Ian. 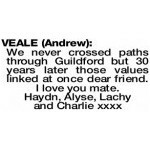 VEALE ANDREW Greatly loved nephew of Gary and Linda and cousin of Kyle and Ilsa Bawden. 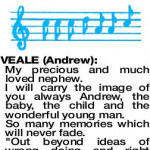 VEALE ANDREW My precious and much loved nephew. 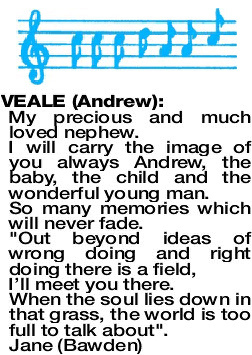 I will carry the image of you always Andrew, the baby, the child and the wonderful young man. So many memories which will never fade. When the soul lies down in that grass, the world is too full to talk about". 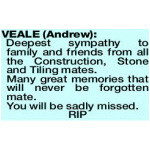 VEALE ANDREW Deepest sympathy to family and friends from all the Construction, Stone and Tiling mates. Many great memories that will never be forgotten mate.